There’s more work to be done to ensure that infants, children and Americans of all ages are protected from exposure to harmful pesticides. But Department of Agriculture tests of thousands of baby food samples between 2010 and 2013 show big declines in levels of harmful pesticide residues. In the 1990s, many highly toxic insecticides were widely used in conventional agriculture. A 1993 study by National Academy of Sciences, “Pesticides in the Diets of Infants and Children,” raised important concerns about the EPA’s limited actions to police pesticide use and its failure to protect children. 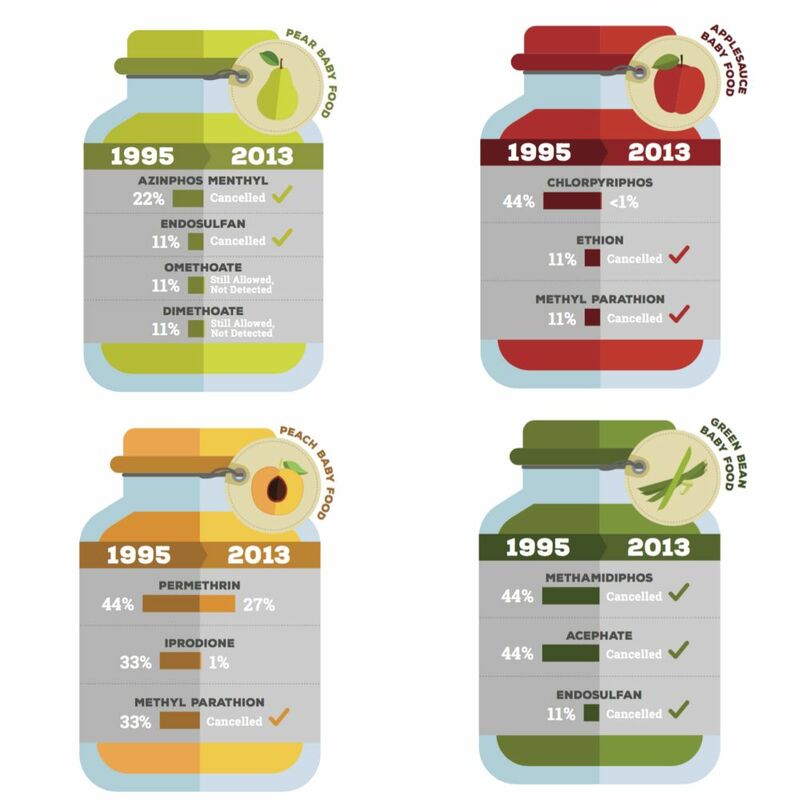 In 1995, EWG tested pesticide residues in 72 conventional baby food samples. We found 16 different pesticides, including three probable carcinogens, eight neurotoxins and five endocrine disruptors. The Food Quality Protection Act directed the EPA to take an immediate look at the most toxic pesticides, and ensure children were not harmed by residues in food and water, or by pesticides drifting from fields into nearby communities. Over the intervening 20 years, the EPA cancelled many of these chemicals, or restricted their use in agriculture and household pest control. In 2012, researchers from the Rollins School of Public Health at Emory University compared the results from the Centers for Disease Control and Prevention’s sampling of thousands of American adults between 1988 and 1994 with the results of sampling in 2003 and 2004. They found a marked decline in metabolites of organophosphate pesticides in Americans’ bodies. Today, with very few exceptions, toxic insecticides are less commonly detected in foods, and are in lower amounts when they are present, than they were 20 years ago. But important work remains. The overall amount of pesticides applied in agriculture shows no sign of decline. Some OPs like chlorpyrifos are commonly used on commodity crops like corn and soy. In fruit and vegetable cultivation, neurotoxic insecticides have largely been replaced by alternatives the EPA classifies as reduced risk. These and other chemicals are still commonly detected in baby food and other foods. The safety of these pesticide residues, while undoubtedly less toxic than that in the 1990s, is not assured. In the last 20 years, we’ve learned much more about children’s unique vulnerability to pesticides. Their bodies have not matured, so they can't metabolize and excrete chemical compounds as quickly as adults. They’re developing rapidly, so small doses of neurotoxic pesticides can cause permanent changes to their brains and nervous systems. The European Union takes more precaution, limiting pesticide residues in all baby food to a maximum of 10 parts per billion. This means companies who want to sell baby food in Europe must use fruits, vegetables and grains with fewer pesticide residues than companies selling on the American market. As a result, many American baby foods could not be sold in Europe. Department of Agriculture tests show that 30 to 40 percent of baby applesauce, and green bean, peach and pear purees contain one or more pesticide residues at concentrations greater than 10 parts per billion. However, no carrot or sweet potato purees exceed the EU limit. EWG will continue to work for removal of highly toxic pesticides from Americans’ food. As always, we recommend that you buy organic when possible. Our Dirty Dozen™ list tells you which fruits and vegetables have the most pesticide residues, and our Clean Fifteen list tells you which conventionally grown items have the lowest levels of pesticide residues.